Cindy Wiesner, Director of Grassroots Global Justice Alliance, joins us from the World Social Forum in Tunisia, happening from March 26-30th. We’re celebrating our 10th Anniversary this year! Global Justice Ecology Project is being awarded the 2013 International White Dove Award this Friday evening from the Rochester Committee on Latin America (ROCLA) in Rochester, NY. The White Dove Award honors GJEP’s long-time international work to protect the environment, defend the rights of Indigenous Peoples, preserve forests, and stop the release of genetically engineered trees. For many years GJEP’s co-founders Orin Langelle and Anne Petermann have worked in solidarity with social movements, communities and organizations from around the world with a focus on Mexico, Central America and South America. This awards dinner also marks the 40th anniversary of ROCLA–which was founded in response to the coup by brutal Chilean dictator Pinochet. GJEP Executive Director Anne Petermann points out that some of the first work GJEP did was in solidarity with the Mapuche people of Chile who are still fighting for the return of their ancestral lands, stolen by the Pinochet regime and given to timber multinationals. But the US has always treated Latin America as a ‘resource colony’ for cheap resources and labor. The struggle for the land and the struggle for peoples’ self-determination are two sides of the same coin. Over the years, GJEP Board Chair Orin Langelle has organized many delegations to Nicaragua’s Bosawas rainforest and to Chiapas, Mexico in rebel Zapatista territory. He directs Langelle Photography and will show slides of GJEP’s work at the Award’s dinner. The International White Dove Award will be presented at ROCLAs Annual Rice & Beans Dinner, Friday, March 1, 2013, 5:30 PM at Gates Presbyterian Church 1049 Wegman Road, Rochester, NY. Note: The following was received by GJEP Executive Director Anne Petermann via email and will be read during the UN’s Cartagena Biosafety Protocol meeting today. We have learned yesterday of the death of Barry Commoner–a great American scientist and, as the New York Times called him, the “lifeguard” of Planet Earth–this past Sunday, in New York City. One of the first individuals to push for a greater involvement of scientists and other technical workers with society’s problems, he co-founded the Scientists Institute for Public Information in 1963 to provide relevant information to journalists and citizen activists. This effort to help empower citizens increased the quality and authenticity of public decision-making. Citizens were thus emboldened to become watchdogs, monitoring governmental and corporate activities and joining collectively to correct them; he insisted that civic society had the right to demand accountability. Commoner’s critique of capitalism’s heedless pursuits of profits regardless of external cost had a profoundly moral basis. He saw social justice concerns linking environmentalism, gender equality, issues of racial harmony, controlling militarism. In our own field of biosafety, Commoner was, in the words of the Times, “a founder of modern ecology and one of its most provocative thinkers and mobilizers in making environmentalism a people’s political cause”. He was associated with the Council for Responsible Genetics, the world’s first NGO to take up the issues of genetic engineering (in the 1980s). In February of 2002, he authored one of the most profoundly important articles for laypeople on the subject of genetic engineering, “Unraveling the DNA myth: The spurious foundation of genetic engineering” (Harper’s Magazine)which exposed “the Central Dogma” that somehow DNA was solely determinative of an organisms life. In 1970 at the time of the first Earth Day, Time magazine featured him on its cover as the “Paul Revere of Ecology,” referring to the American Revolutionary who warned citizens of danger from approaching British troops. Yes, Commoner sounded some of the first alarms over biosafety; we in the NGO community remember him with pride as we continue to respond to threats to the Earth’s well-being. Note: Global Justice Ecology Project Executive Director Anne Petermann and Board Chair Orin Langelle were in St. Louis over September 16 and 17 for the GMO-Free Midwest Conference and the Occupy Monsanto day of action. The events were organized by the Organic Consumers Association and the Gateway Greens Alliance. Petermann spoke on the first day of the GMO Free Midwest conference on the dangers of genetically engineered trees at C.A.M.P. (Community Arts and Movement Project) near downtown St. Louis. Langelle spoke against the Green Economy during day two of the GMO Free Midwest conference. Day two of the conference was held simultaneous to the “12th International Symposium of Biosafety of Genetically Modified Organisms” at the Millennium Hotel, adjacent to the St. Louis arch. The second day of the conference and the Occupy Monsanto actions which followed were held in celebration of the one-year Anniversary of Occupy Wall Street. The photo essay below is from the day of activities against Monsanto, both the conference at the Millennium hotel and the three actions that followed. The actions included a rally outside of the Millennium Hotel, an action at Whole Foods directed at their policy of allowing GMO foods to be sold in their stores, and an protest outside the world headquarters of Monsanto in Creve Coeur, Missouri. Anti-Monsanto protester is interviewed by the local media. Photo: Langelle/GJEP. The article pointed out that ensuring the health of the global economy requires expanding oil production. This, as we know, will worsen the climate crisis. The takeaway message of the article, therefore, is that the global economy will only thrive by destroying the life support systems of the planet. At the Rio Earth Summit, this was also the underlying logic of the so-called “green economy” proposals that have polarized and paralyzed the talks since the first preparatory meeting for Rio+20 in May 2010. At the Rio+20 summit, industrialized countries and multinational corporations, accompanied by institutions like the IMF and World Bank, led the push for development of the green economy—that is, to use the very ecological devastation caused by global capitalism to create markets in so-called “environmental services” by turning them into tradable commodities. These new markets would help prop up the global economy in a greenwashed version of business as usual. “Environmental services,” provided by intact natural ecosystems—which include such things as the storage of carbon, the purification of air and water, and the maintenance of biodiversity—would be given a monetary value in the market, enabling them to be purchased and supposedly protected. In reality, however, it would allow companies to destroy a biodiverse ecosystem in one area, by purchasing the protection of an equivalent ecosystem. Over August 9-12, fifty participants and trainers gathered in Vermont’s Northeast Kingdom for a Climate Justice Direct Action Training Camp. The camp, organized by Red Clover Climate Justice and co-sponsored by Global Justice Ecology Project provided essential direct action skills including formation of affinity groups, blockading tactics, legal rights as a protester, a history of non-violent civil disobedience, strategic planning for direct action, and the nuts and bolts of media work to ensure actions and their messages are seen as widely as possible. Climate justice involves taking real and just action to address the root causes of the climate crisis, and transforming the system that is driving it. Direct action has a rich history of achieving the unthinkable, of changing “the impossible.” It is defined as action to directly shut down the point of production. In the case of climate change, it would be action to shut down the point of destruction. With the climate crisis worsening exponentially with every passing day, shutting down the point of destruction is critical. It was with this in mind that the direct action training camp was organized. Coincidentally, it came just two weeks after the 36th Conference of New England Governors and Eastern Canadian Premiers in Burlington, Vermont. A major focus of that conference was energy. Vermont, which has an image of pristine greenness, relies on dangerous and dirty energy sources. This includes its aging Vermont Yankee nuclear power plant; hydroelectricity from massive dams on Indigenous Peoples’ lands in northern Quebec; and large-scale biomass electricity, which dumps more pollution into the air than coal. Although these various mega-projects do not rely on fossil fuels as the main source of their energy, they are still “false solutions.” They cause vast ecological and social destruction and can worsen the climate crisis. Their primary function, in fact, has nothing to do with the climate. It is to maintain business as usual. While the climate crisis demands a radical re-think of how we live on and with the Earth, a fundamental changing of the system, “false solutions” are specifically designed to prevent real change. They enable the Global Elite–“the 1%” –to maintain their power and profits in the face of mounting social and ecological crises. 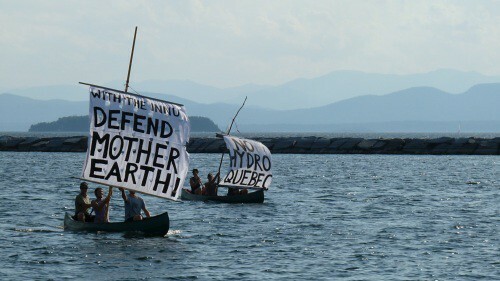 Hydro-Quebec plans to build a series of new mega-dams on First Nations land in northern Quebec. They will drown forests, pollute fresh water, and displace villages and release huge amounts of methane–a greenhouse gas 35 times more potent than CO2. In response, a delegation of Innu people came to the Governors’ Conference to raise awareness about and protest these new mega-dams. When the Innu delegation tried to enter the Governors’ Conference to speak with the decision-makers, however, they were refused entry. The Governors’ Conference was emblematic of the unjust system that must be changed if we are to successfully address the climate crisis. A group of privileged white males sat down to make decisions that would irrevocably impact the lives of First Nations peoples in Canada, as well as rural communities throughout the region.